Blaster Master Productions has debut their new video series, Sessions On The Hill featuring LA’s very own Wires in the Walls. If you follow Wires on instagram or twitter you’ll know this is the ‘shoot’ they were teasing fans with a couple of weeks ago. Thank You Blaster Master Productions for a great video!! 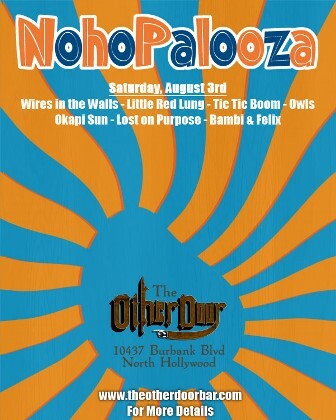 See Wires in the Walls perform this song (and others) along with LA finest, Little Red Lung, Owls, Tic Tic Boom and more…..on August 3rd for NoHoPalooza! And don’t forget to check out Blaster Master website for more production information. Last night I went to the Satellite in Silverlake to see new LA band called Owls. This is my second time seeing the Owls and after each set I’m even more impressed with their sound and damn near do cartwheels over the fact they have a really good lead singer. Sadly, I’ve been seeing more bad lead singers than good and the Owls is simply a refreshing band. Despite the early set time they seemed to draw the crowd in and even got people on the floor to even momentarily forget they’re in LA and actually dance. Its offical……I’m looking forward to their next gig!